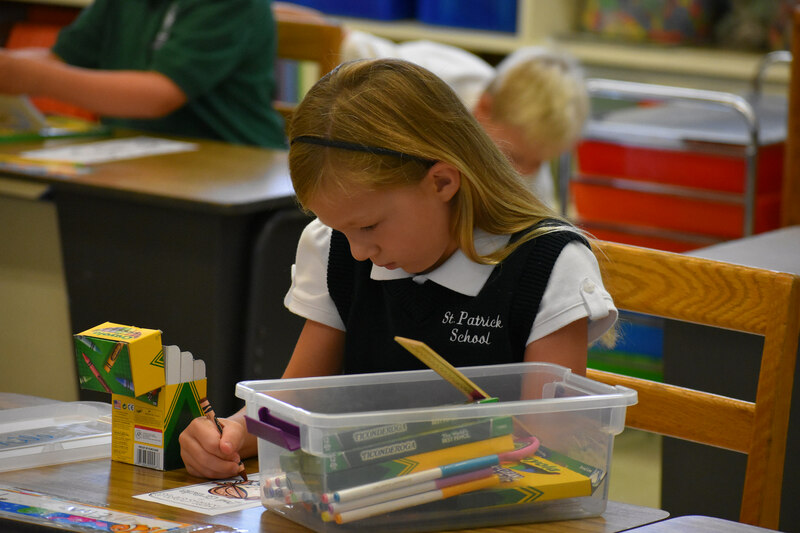 The Primary Division, from Kindergarten through 2nd grade, is deeply invested in Catholic education, especially at St. Patrick School. Four of our teachers and one aide are graduates of St. Pat’s. Three of our teachers are graduates of St. Pat’s. Four have children who currently attend or who have previously graduated from St. Pat’s. Our students benefit from small class sizes with individual attention and are held to high expectations. Teachers attend to the whole child in a loving environment where parents have the opportunity to become part of our community. Our teachers are highly qualified and continue to seek professional development in all areas of the curriculum. Instructional materials for teaching religion have been approved by the Archdiocese of Seattle. The curriculum is based on the new Religion Standards recently adopted by the Archdiocese and reflects the New Roman Missal. There is a particular emphasis on the Mass and the Sacraments at each grade level, with additional preparation in the second grade for First Reconciliation and First Eucharist. There is a goal at all elementary grades of at least 90 minutes of literacy instruction daily. English Language Arts instruction is based on Common Core Standards developed by the State of Washington. Teachers use the Houghton Mifflin Reading program which incorporates writing, grammar, spelling and various other resources to assist in meeting and exceeding the new standards. Teachers supplement this curriculum with other non-fiction reading opportunities. Teachers are trained in the Slingerland Multisensory Structured Language Approach. Math instruction is taught using the Houghton Mifflin Go Math! Program, which is aligned with the Common Core. It includes the use of manipulatives, direct instruction, and many opportunities for enrichment. Students study science using Full Option Science System (FOSS) kits that provide meaningful hands-on lab experiences, data collection, and research study. Science is also integrated into literacy and math. Students study social studies with the use of a Houghton Mifflin textbook (in first and second grades), leveled reading books, field experiences, and research projects. Students receive weekly instruction in physical education, art, vocal music, and library skills.